Filling bags or pots manually can be heavy and tedious work. Slow, inefficient, labor consuming and can cause injuries to backs and hands. About 50 years ago, C-Mac started to manufacture bagging equipment to solve these problems! Why fill bags by hand? Let the machine do the hard work. 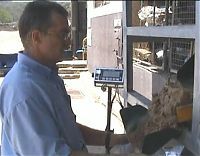 Saves you time, earns you more dollars per ton of material by bagging. Produce more bags per minute to increase your production. 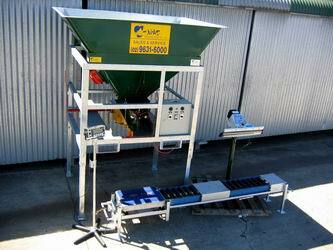 Increases your work efficiency and saves labor (cost) by filling bags quickly, accurately, and reliably. Personnel will spend considerably less time and won't mind filling bags. Staff can than be better utilised effectively elsewhere on site. Minimizes operator fatigue, reduce risk of getting injuries. Workers risk injury when undertaking manual repetitive tasks such as back injuries and knuckle injuries. See documents "Worksafe Safety Issues in nurseries"
Different sized chutes are supplied to suit a filling of varying size pots and bags. 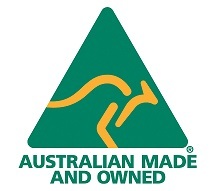 Australian made product in Sydney NSW. ISO 9001:2015 Quality certified ensuring procedures are maintained and continuously improved. 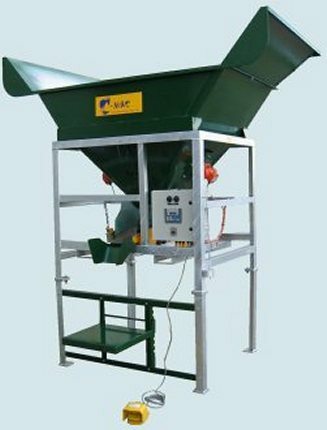 Over 50 years manufacturing a reputable “Ezi Bagging Machine” supplied to landscape suppliers, Landscaping & Gardening Contractors and the Nursery & Garden Industries. Automatic control – set the electric timer, depress the foot pedal control and feeder will cut out at the selected time. It will not operate until the pedal is depressed again. Nurseries and landscape suppliers usually have to add fertiliser with potting media, C-Mac has now developed a bolt on dibbling unit for our Ezi Bagger to meet customers’ requestes. Past practice has been to toss a handfill or scoup of feriliser on top of the mix after the pot has been filled. When filling buckets or doing any bagging, the manual process of adding fertiliser can now be replaced by the ezibagger filling machine. The Ezibagger dibbling accessory allows nurseries to mix an accurate measure of fertiliser into media as it is being deposited into a bucket, pot or bag, giving it a even spread throughout the mix. Restart the process (4) every 6 12 seconds depending on container size. 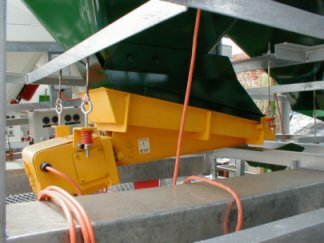 W hen you have a powdery product and vibration isn’t the ideal solution, C-Mac can now provide a screw conveyor that simply bolts on under the large receiving hopper. The screw feeder is integrated with the PLC control box and can be set to run manually or on a set time or weight of product in container. 240 volts, single phase, 10 amp rating. The dual axle trailer is rated for moving with full load. It is however recommended the unit to be emptied before relocation. Tare weight: approx. 1 tonne. Aggregate weight: 2 tonne. Can be towed behind most utes and four wheel drive vehicles. Note: Up to $1,000 refunded if a new machine ordered within one (1) month.